Summer’s here and you can finally enjoy some much needed time in the sun with your little one. However, before you head out on your little adventures, it’s important to know how to keep baby safe in the hot weather. Their delicate skin that produces that yummy new-born scent is also extremely sensitive to the effects of the sun’s rays. If you aren’t careful, the heat could soon make your infant feel really unwell. 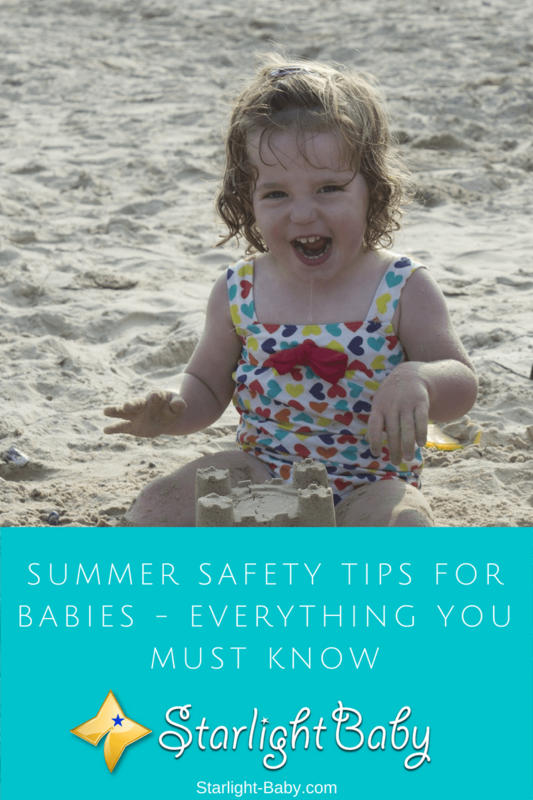 Here you’ll discover the potential hazards of the sun for your baby and top tips on how to keep them safe throughout the summer months. Most worryingly, overheating has actually been linked to sudden infant death syndrome. So the risks are potentially fatal, making it vital for you to take necessary precautions. So how can you keep baby safe and comfortable this summer? The sun’s heat is more intense at certain times of the day. If you want to be extra cautious, be sure to avoid the peak times between 10am and 4pm. Of course, this isn’t always possible if you need to head out for the day. However, sticking in the shade as much as you can during the peak times will really help. It’s also worth keeping in mind that during these peak times, the sun’s rays will bounce off various surfaces including cement, water and sand. So it’s best to avoid these too if you can. When venturing out during peak times, make use of the sunshade provided on baby’s stroller. You can buy these separately if yours currently doesn’t have one and it may actually be better to buy a more specialised model as these come with built in UV protection. Even if you stay in the shade, your baby is still only partially covered against the sun’s rays. You should never leave home without a bottle of infant sunscreen. It should contain a SPF of at least 15 and should also be applied frequently throughout the day; particularly if you take them swimming. It’s also a good idea to look out for a sunscreen that protects against UVA and UVB rays. While you can use adult products, the infant and child variations are a lot safer to invest in as they contain fewer additives that can be irritating for your baby’s skin. When it’s hot your baby will get uncomfortable pretty quickly. Therefore, you really need to pay attention to how you dress them before you head out. A wide brimmed hat is highly recommended as this will protect the head, eyes and forehead and neck from burning. You may be surprised to learn that the colour of the clothing matters too. Dress them in light coloured clothes as darker garments will absorb the sun, making your little one extremely uncomfortable and susceptible to heat stroke. Of course, the clothing should also be lightweight too. Another good tip is to make sure the clothing is tight-woven. It’s logical to think an item of clothing which you can see through when you hold it up to the light, would be a good choice for hot weather. However, those little holes that you see provide the perfect opportunity for the sun’s rays to get through. Opt for tight woven materials to keep baby’s skin fully protected. You can also try out baby sunglasses. It’s worth noting here that your baby may not love the feel or look of the glasses so it may be a struggle to keep them on. However, some babies don’t mind so it’s worth trying as they provide excellent protection for the eyes against the sun. Just like adults, babies get more dehydrated in the sun. However, keeping them hydrated can be difficult; especially if they are younger than six months old. Water shouldn’t be provided until your little one is at least six months of age and even then it should only be given in very small quantities. For younger infants, you will need to nurse them with breastmilk or formula a little more frequently than you would indoors. If your infant is six months old and over, you can add a little water alongside juicy fruits to help with proper hydration. Fruit juice lollies and ice cubes can also be a good option. To make sure they’re comfortable, water play is an excellent idea. Paddling pools, sprinklers and even a cool bath can all help to cool baby down. If using a paddling pool, ensure it is placed in the shade. Also remember to reapply sunscreen after water play has ended. You can keep them extra cool by letting them dry naturally, rather than with a towel. If you’re heading out in the car, remember your baby is going to feel the heat a lot more than you do. The inside of a car can get extremely hot so remember to keep the windows down and the air conditioning on. Never leave your baby in the car alone, even if you’re just popping into the shop for a minute. It doesn’t take long at all for infants to overheat so park in the shade and take them with you. Something you might not have thought of is switching to a more summer friendly carrier. A tight fitting carrier can become much too hot for baby, so instead opt for a lightweight nylon model. Pay attention to baby’s face too. If you notice they look a little flushed, remove them from the carrier straight away. Overall, there are so many things to consider when keeping your child safe in the sun. If you want to make sure you enjoy the hot summer months with your little one, it’s important to follow the tips above. After all, it’s much better to be safe than sorry. I’m excited to read how we can protect our babies from series of sun hazards and the need to take up the necessary precautions while we enjoy the summer time with the babies. Apart from vaccinations and regular check-up, we have not taken our baby out in the last 10 months since the baby was born. However, this summer, our baby will be one year old and we might take him outdoors for fun. I have heard about baby sunscreen, however, I have never used it. Experienced parents have always suggested us to cover up the baby and not to expose the skin in the sun or outdoor air. I think using thin clothes to cover the baby is better than using chemical induced sunscreens.